After crossing over from the Greek mainland at the Hellespont and defeating the Persians for the first time at the Battle of Granicus, Alexander went southwards throughout Ionia along the Mediteranian to free the Greek cities from Persian rule and to secure the coast of Asia Minor. He then turned northward to Gordium, home of the famous Gordian knot. The legend behind the ancient knot was that the man who could untie it was destined to rule the entire world. Alexander simply slashed the knot with his sword and unraveled it. After leaving Gordium, he marched southwards again, into the Cicilic plains. He now formed a serious threat not only to Lybia but to the heart of the Persian empire. Darius knew that he had to come to action quickly. 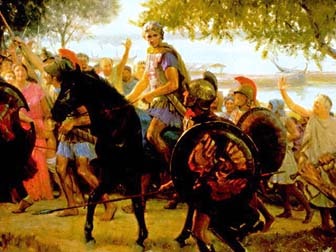 Darius slipped pass Alexander's army and positioned himself between Alexander and the Hellespont: Alexander would have serious problems with his supplies and there was no way back to Macedon. Alexander was surprised by this sudden movement but Darius had made a big mistake by positioning himself in a small area between the ocean and the mountains; he would never be able to utilize his immense army effectively. In November of 333 BC Alexander met Darius for a second time at a mountain pass at Issus. There ensued a furious battle necessitating frequent changes in tactics by both forces. The Persian cavalry was almost completely encircled by Macedonian light troops and the advancement of the phalanx. The battle was still very much at issue when Alexander led a charge with his heavy cavalry straight at Darius himself; he was easy to spot in his golden chariot. Seeing Alexander cutting his way through the Persians and making straight for him, Darius panicked and fled. Once the king was seen abandoning the field, the Persians collapsed and fled in disarray. Alexander couldn't immediately pursue him because there were some remnants of the battle to be concluded. 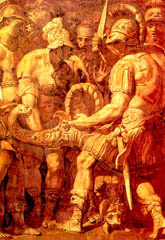 Darius had escaped in a lighter chariot and left his mother, wife and children behind who were captured by Alexander who treated them with the respect due to royalty. After this battle the most obvious strategy would have been that Alexander move to the east together with his army and royal hostages, to the heart of the Persian Empire before Darius had time to recruit new soldiers. However he was determined to fulfill his first plan, which was to gain control over the coastal areas. He moved southwards down the Syrian coast and Sidon and Byblos surrendered to him without a fight. Completely different was the situation at Tyre which is the subject of The "Siege of Tyre".